Apart from regular Open, High, Low, Close, Volume, OpenInt fields – AmiBroker database allows to store custom data in auxiliary fields called Aux1 and Aux2. This allows to import our custom arrays and store in the database. Since the data stored in those fields will vary, depending on the actual records imported in there – then in case of time-compressed intervals we may need to determine how exactly these values are compressed if we e.g. switch from Daily to Weekly interval. By default these values would get compressed the same way as Close field, i.e. Last value from given period would be used. 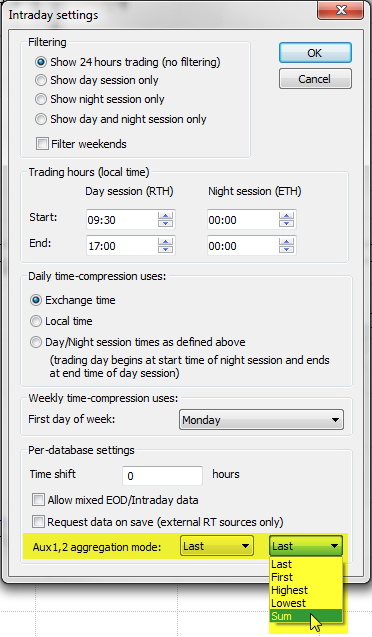 We can however choose specific compression method if we need these fields to behave differently (for example like Volume, where weekly record represents a Sum of daily volumes).